Well over half of those benefiting from local minimum-wage increases are women, workers over age 20, and full-time workers. As we have shown, about 85,000 Iowa workers stand to gain from local minimum-wage increases in Linn, Johnson and Polk counties when they are fully phased in as scheduled in 2019. As we show above, the beneficiaries are not who minimum-wage proponents typically attempt to portray in dismissing the importance of the wage. Well over half are women, workers over age 20, and full-time workers. These are jobs that are essential in meeting household budgets. Iowa’s minimum wage is $7.25, where it has stood for over nine years. Johnson, Linn, Polk and Wapello counties have passed increases scheduled to reach between $10.10 and $10.75 by 2019. For more about the minimum wage in Iowa, both statewide and locally, visit this page on the IPP website. Editor’s Note: The Iowa House of Representatives now denies the ability of lawmakers to use visual aids in debate on the floor. To help Iowans visualize what kinds of graphics might be useful in these debates to illustrate facts, on several days this session we are offering examples. 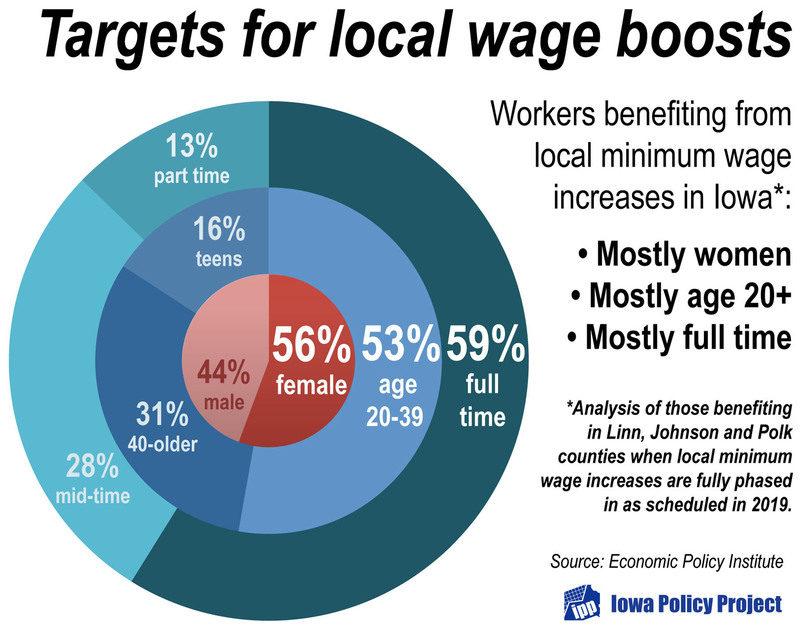 In today’s graphic, we illustrate the impacts of local minimum wages that have been approved in Iowa. We focus on three of the four counties where wages higher than the statewide $7.25 has been approved. In the fourth county, Wapello, the impact has been blunted by the refusal of the city of Ottumwa to go along with it. Is it time for Woodbury County to join the party? This week, two more counties in Iowa — Linn and Wapello — joined Johnson County in setting a countywide minimum wage. 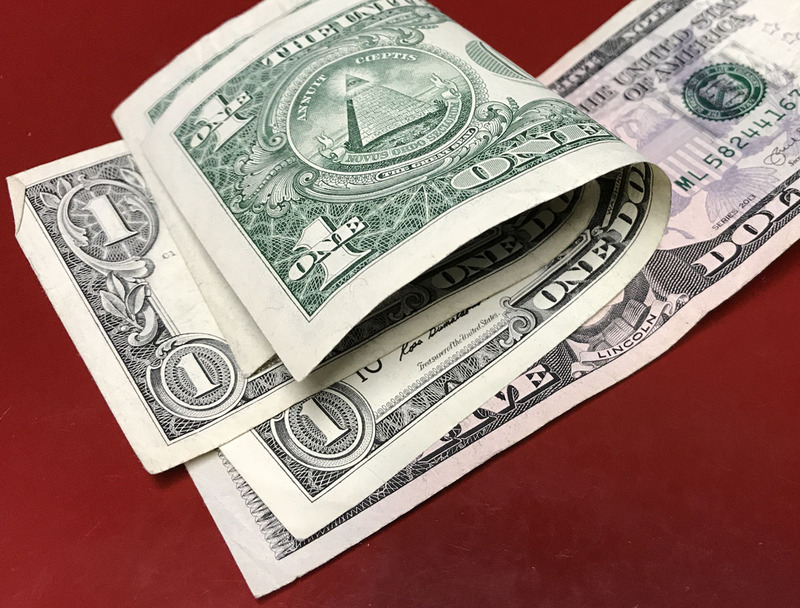 In Linn County, the wage will rise to $10.25 by January 2019, while Wapello County followed Johnson County’s lead in raising the wage to $10.10 in three installments. Polk County is expected to take up a proposal soon to raise the wage there to $10.75 by 2019. Lee County supervisors, meanwhile, have appointed a study group to consider a minimum wage. Unlike these counties, Woodbury is part of a three-state metropolitan area that includes counties in Nebraska and South Dakota where the state minimum wage has already been raised above the federal. The minimum wage is currently $8.55 in South Dakota and $9.00 in Nebraska. 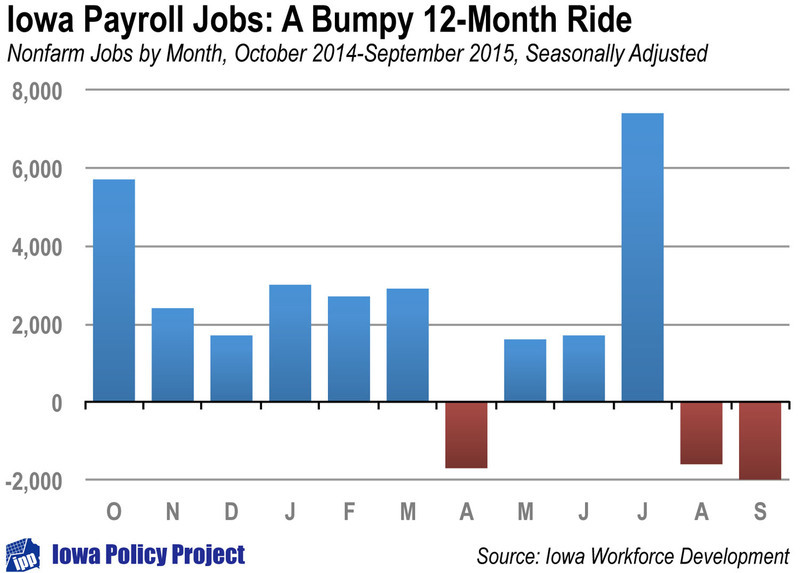 Sioux City employers are already competing in a labor market with wages above the Iowa minimum of $7.25. Using data from the U.S. Census Bureau’s American Community Survey, economists at the Economic Policy Institute estimate that about 10,000 workers in Woodbury County would see an increase in their hourly wage if the county set a minimum equal to Nebraska’s $9.00 by January 2018. Those 10,000 workers on average would see their annual income rise by about $1,500. The Census data dispel the usual myths about low-wage workers. In Woodbury County, over 80 percent of those benefiting from the $9.00 or $10.10 minimum would be age 20 or over, with about a third over age 40. Well over half of them work full time. About 26 percent are parents, and 3,400 to 4,700 children live in a family that would see a rise in income. Raising the minimum wage puts more disposable income in the pockets of the work force. Much of that income would be returned to the local economy as workers spend more at grocery stores, car dealerships, clothing stores, restaurants, theaters — in fact, throughout the local retail and service sectors. 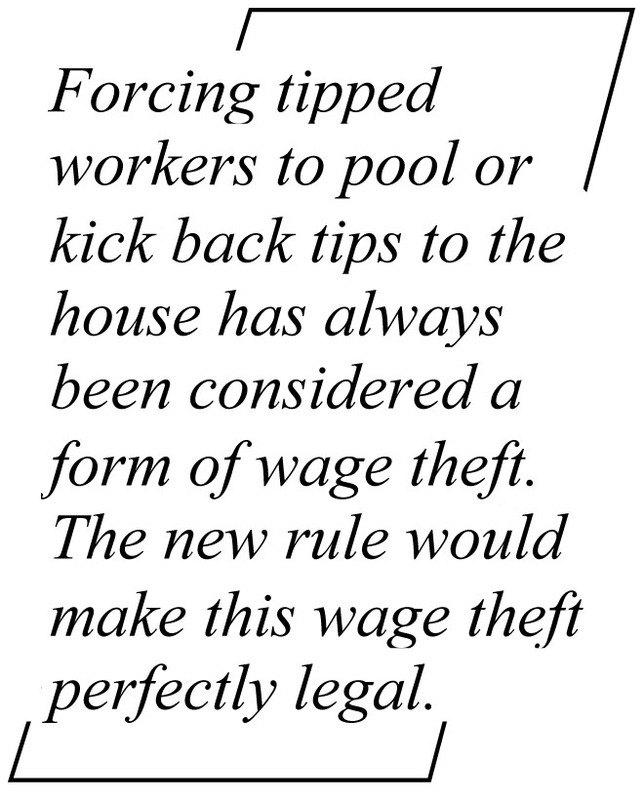 Increased sales in turn would create a need for more workers. It is this increase in local spending that is a major reason that studies of local minimum wage laws have found no effect on employment. The higher labor costs to employers are offset in part by increased demand for their goods and services, and in part by lower employee turnover and greater productivity. 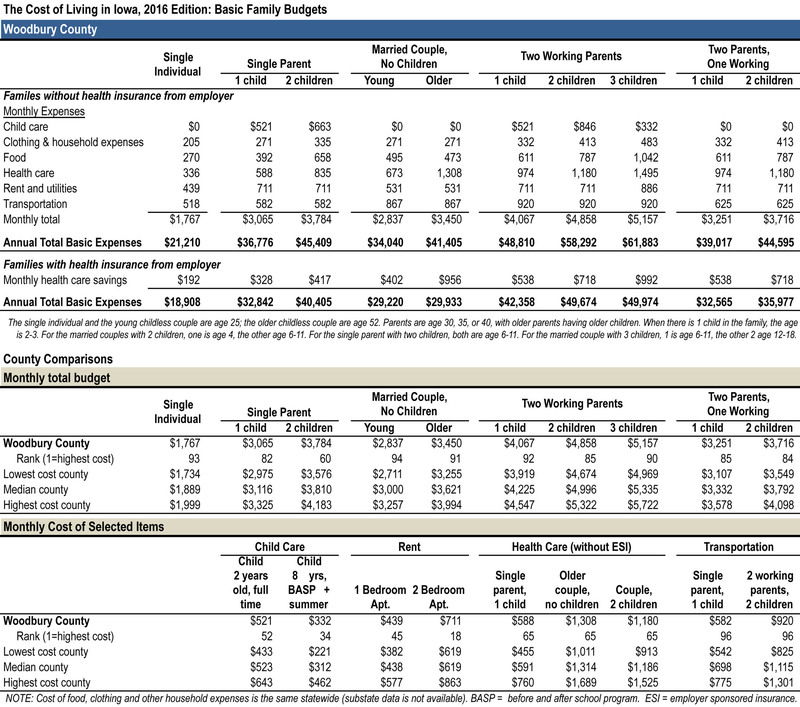 The Iowa Policy Project’s 2016 Cost of Living in Iowa shows what it takes for families to get by, just covering basic expenses for food, rent, transportation, child care and health care. 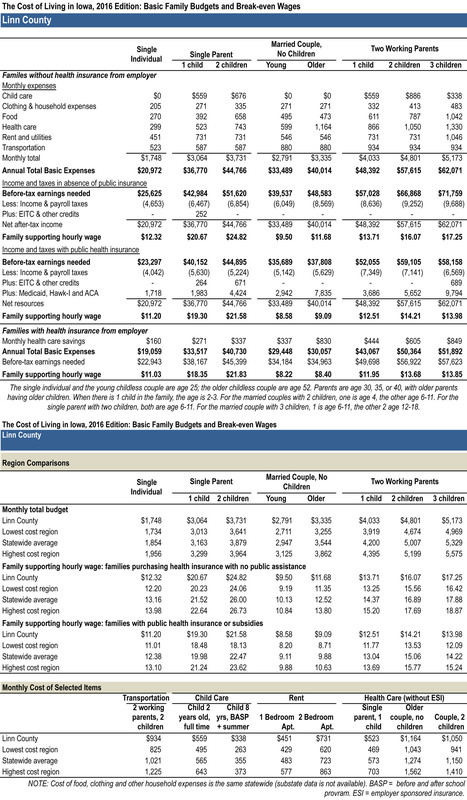 In Woodbury County, a married couple who both work and who have two children needing child care would each need to earn at least $13.00 an hour to get by, even with health insurance provided by an employer. Without health insurance, they would need to make over $16 an hour. Even a single person living alone would need a wage of $12.46 to get by without public assistance, or nearly $11.00 an hour in a job with health benefits. While $9.00 or $10.10 does not represent a living wage in Woodbury County, it gets workers closer to that goal and helps thousands of families, many struggling below the poverty line. And it provides a significant boost to the local economy through increased spending. [i] These estimates include those affected directly and indirectly. 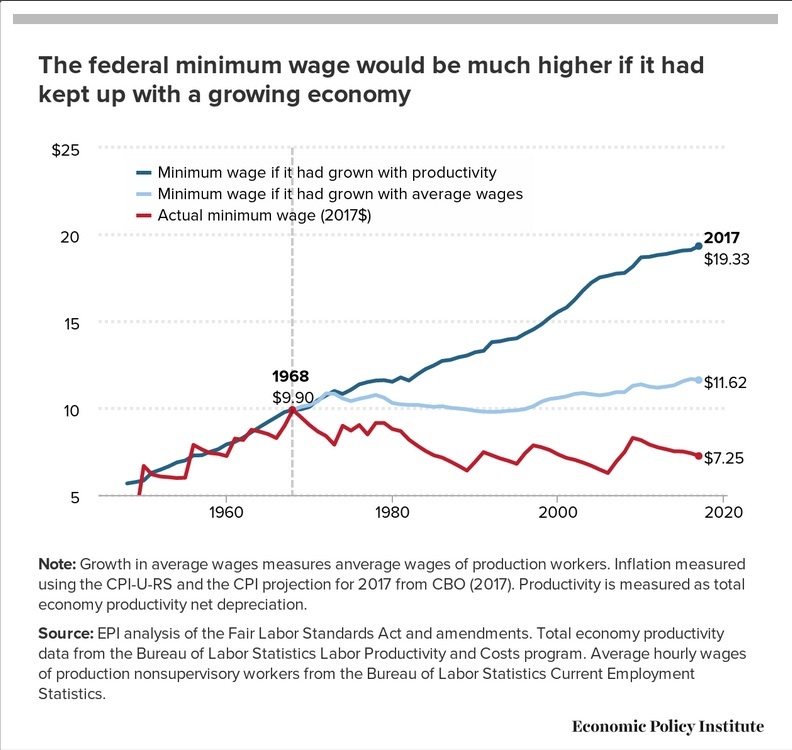 About three-fourths of the workers gaining a higher wage represent those earning less than the new minimum. But the other fourth represent those a little higher up the wage scale who would benefit as employers adjust pay levels to remain competitive or to restore parity within a business. Author iowapolicypointsPosted on September 14, 2016 Categories Economic Opportunity, OrganizationTags Economic Policy Institute, economy, Iowa Policy Project, Johnson County, Lee County, Linn County, minimum wage, Peter Fisher, Polk County, Wapello County, Woodbury CountyLeave a comment on Is it time for Woodbury County to join the party? Whichever way Solon council members vote on a local minimum wage, they should make the decision with good information, not discredited myths. As the Solon City Council decides whether to back out of a Johnson County minimum wage increase, good information is available for comparison to recent comments by council members. Peter Fisher of the Iowa Policy Project took a look recently at what a larger increase — to $15 — would do in Johnson and Linn counties. That report is here. 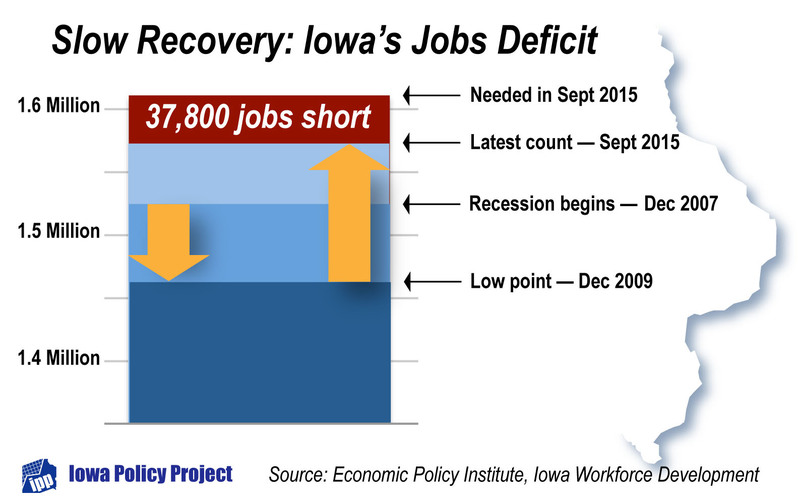 Separately, we have an Iowa Policy Project fact sheet available here on how Iowans statewide would be affected by an increase to $10.10, which is the level recently established by Johnson County supervisors to be phased in by 2017. In fact, the wage has been held so low for so long that it has become is part of a larger low-wage climate in our state, so that parents account for 1 in 5 of those who would be helped by a $10.10 minimum statewide. And almost half — 46 percent — of total family income in homes with a worker making less than $10.10 an hour comes from that job. One council member ignores a lot of people in Iowa, very likely many of his own neighbors, when he suggests this is all about part-time work. More than 4 in 10 — 43 percent — of the workers who would benefit from an increase to $10.10 in Iowa are working full time. Finally, an observation by a third council member is particularly noteworthy — that local restaurants are having trouble finding help. Wonder why that would be? Something about low pay, perhaps? How many more would be willing to work if pay were increased? How many more would be patronizing local businesses because they could afford to do so? It is certainly up to the good people of Solon and their leaders to decide whether to go along with the new Johnson County ordinance, and by doing so to put pressure on the state to raise the state minimum. The latter, by the way, is what some council members are quoted that what they want to see: a statewide increase. Yet with no local pressure, is that really the message they send to state lawmakers who are holding Iowa’s minimum below that of 29 other states? Whichever way they decide, however, they should be making the decision with good information, not discredited myths.